For healthcare providers who use biomedical adhesives that are toxic or have poor performance, we are developing a strong, non-toxic glue that can be used on wet surfaces in a surgical setting. Figure 1: (a) There is currently a market gap in that there is no strong biocompatible adhesive that can compete with staples and sutures. (Source). 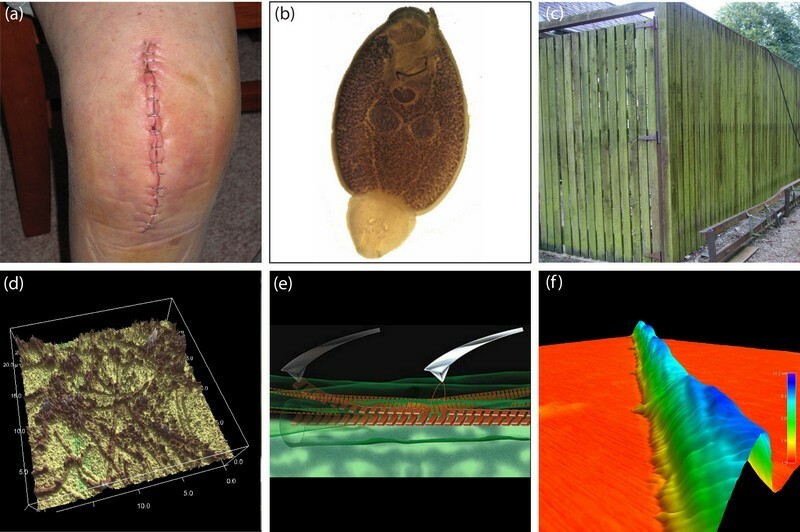 (b, c) Nature has evolved a broad range of adhesives that stick in moist or aqueous environments (we show (b) a marine-based parasitic flat worm that attaches to fish skin, and (c) green algae strongly attached to a fence in Limerick, Ireland). (d) The natural adhesives we are investigating are composed of protein nanofibrils. (e) The nanofibrils are in a cross beta-sheet configuration known as amyloid and we have shown that the core intermolecular beta-sheet structure of amyloid adds mechanical strength to the nanofibrils and to biomaterials which contain them. (f) Amyloid is a well defined generic protein structure (cross beta-sheet quaternary structure) and this has enabled us to apply for the patented usage of amyoid in biomimetic adhesives. To learn more about this research, please view the video links below. Video recorded for 'Your Science Your Say', a forum where emerging technologies are presented to the public to assess perceived risks and benefits to society. Presented at the Science Gallery, Trinity College Dublin, July 2009, and as an online forum. Produced by Padraig Murphy, Dublin City University, and Ian Brunswick, Agtel Communications. Irish television news programme, 'Capital D' Episode 23, broadcast on RTE One, 15th October 2009. Produced by Philip Bromwell; Presented by Anne Cassin. Nanoscale mechanical characterization of amyloid fibrils discovered in a natural adhesive, Mostaert, A. S., Higgins, M. J., Fukuma, T., Rindi, F., and Jarvis, S. P., Journal of Biological Physics, 32, 393-401, (2006).